Clafoutis is a French baked custard and fruit dessert. It is often made with whole cherries, but you can use other fruit as well. I have made it with berries, but my favorite combination is peaches, cherries, and plums. Right now they are all in season, so make this before the cherries have disappeared from fruit stands and farmers’ markets. It can be served warm or chilled, with confectioners sugar sprinkled over the top. I prefer it cold because the flavors meld together. This recipe is adapted from one I learned to make at a Sur La Table cooking class, originally a Julia Child recipe. Preheat oven to 350 degrees. Grease an 8-cup gratin dish or 9×13 baking dish. In a medium bowl combine cherries and plums. Toss fruit with brown sugar, then spoon into prepared pan. In a blender combine milk, cream, flour, vanilla sugar, salt, eggs, and vanilla. Blend until the mixture becomes a smooth, crepe-like batter, about 2 minutes. Pour 1/4 of the batter over the cherry and plum mixture and bake 5-7 minutes until a thin film begins to form on the batter. Remove from oven. 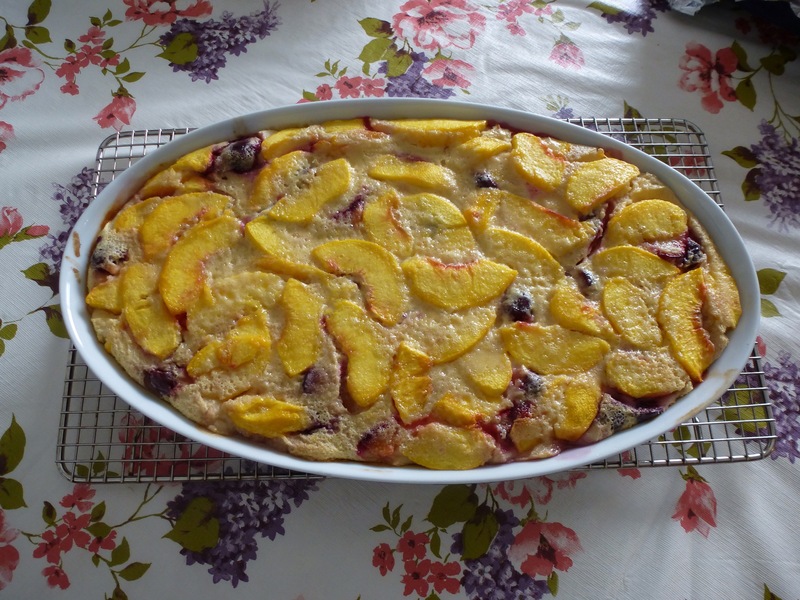 Place sliced peaches over the cherry and plum mixture. Sprinkle peaches with remaining 2/3 cup of granulated sugar and pour the rest of the batter over the peaches. Return to the oven and continue baking for 45-50 minutes until the pudding is puffed and set in the middle. Remove from oven and allow to cool on rack. Serve warm or cold, sprinkled with confectioners sugar. Serves 8. This entry was posted in Custards, Desserts, Fruit. Bookmark the permalink.